Secretary of State John Kerry's Tuesday call to his Russian counterpart has gone unanswered for nearly a week after North Korea tested a nuclear device. Kerry called Russian Foreign Minister Sergei Lavrov and top diplomats with the three other countries – South Korea, China and Japan - that had been in negotiations with North Korea over its nuclear program. 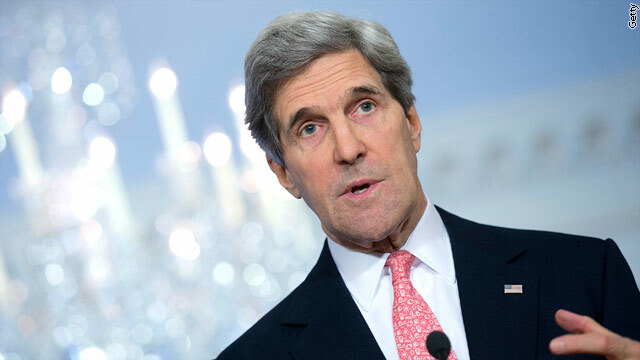 But Kerry was not connected to Lavrov, who was in Africa for a conference and had "a very overloaded work schedule," according to Russian government spokesman Alexander Lukashevich. 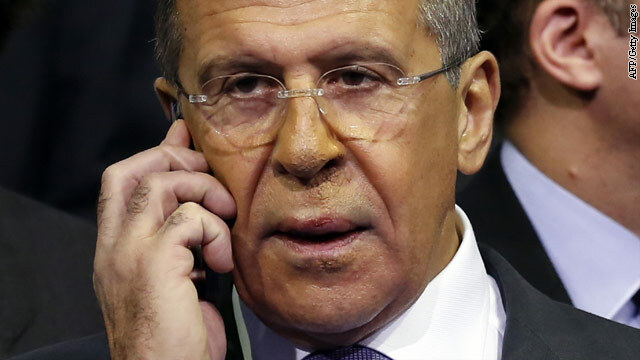 He said that the United States did not make additional attempts to call Lavrov. Russia is an ally of North Korea and a member of the six nations that have held talks over the North Korean nuclear program. The U.S. and North Korea also find themselves on opposite sides of the situation in Syria and have sparred over Russian restrictions on adoptions between the two countries. Sergey Lavrov said Wednesday that Moscow was “somewhat surprised” by Obama’s statement that the U.S. recognizes the Syrian opposition coalition as the legitimate representative of the Syrian people, in opposition to the Assad regime. “None of the U.S. decisions here should be of any surprise to the Russian Federation. We have been very clear at all levels, publicly and privately, that we would continue to look for ways to support the political opposition in Syria,” a Senior State Department offical told CNN. Amid reports that the regime of Syrian President Bashar al-Assad may be preparing to use chemical weapons, the United States is making a new diplomatic push to end the conflict that has killed at least 40,000 people. In Dublin for a European security meeting, Secretary of State Hillary Clinton will meet Thursday with Russian Foreign Minister Sergey Lavrov and take part in a three-way meting with Lavrov and U.N. Special Envoy Lakhdar Brahimi. "They had an exchange on how extremely seriously we need to be in continuing to send messages about the red lines and unacceptability of use or loss of control of chemical weapons," a senior State Department official told CNN after Clinton's first meeting with Lavrov in Dublin. 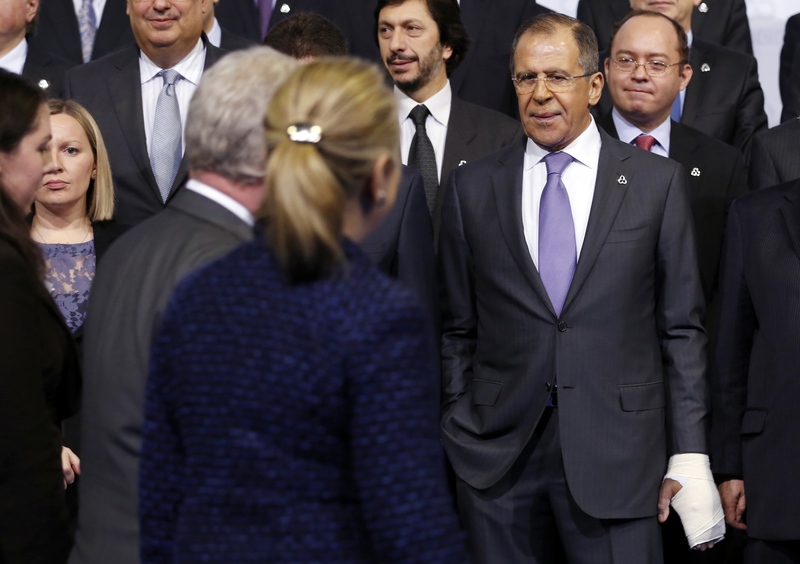 "Secretary Clinton thanked Minister Lavrov for his strong public statements on that." Russia has blocked action against al-Assad at the United Nations, but diplomats say that Moscow, which has insisted there should be no "regime change" in Syria, now increasingly doubts that al-Assad can survive in power. Brahimi has not yet proposed a specific plan to try to end the fighting, but Clinton and Lavrov did work one out in June in Geneva. A Russian official tells CNN that Moscow has not sold new helicopters to Syria in years, but rather simply refurbushing them. But the State Department says whether they are new or old, they are still killing people. Foreign Affairs Correspondent Jill Dougherty reports. The Russian government is not sending new helicopters to Syria, but it refurbishes choppers it previously sold, a Russian official told CNN late Wednesday. U.S. Secretary of State Clinton said this week the United States had information that Russian helicopters were being shipped to Syria, where a fierce crackdown against a grass-roots anti-government movement has persisted for 15 months. Clinton stood by her comments even as Russian Foreign Minister Sergey Lavrov denied his country was sending any equipment that could be used against protesters. "We are completing right now the implementation of contracts that were signed and paid for a long time ago," Lavrov said Wednesday after talks with his counterpart in Iran. "All these contracts concern exclusively anti-aircraft defense." It's almost a throwback to the Cold War: a toxic mixture of distrust, weapons shipments and chess moves to preserve spheres of influence. But that's how Russia and the United States have been maneuvering over Syria. Moscow's latest gambit is to propose a regional solution that hinges on Iran and Turkey helping implement the six-point peace plan developed by former U.N. Secretary-General Kofi Annan. The timing of the initiative is no accident. 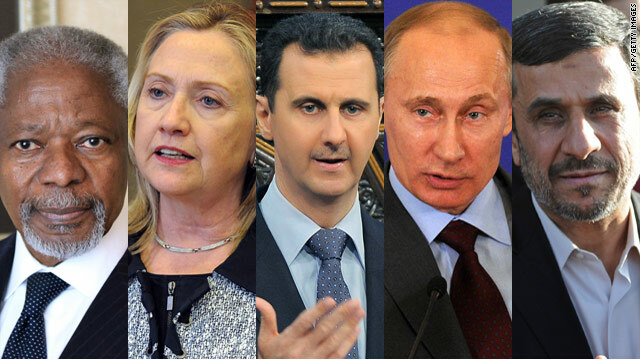 It was announced by Russian Foreign Minister Sergei Lavrov in Beijing just as the U.S.-led Friends of Syria group gathered in Washington to plan further steps to isolate and ultimately remove Syrian President Bashar al-Assad, and Secretary of State Hillary Clinton arrived in Turkey for an informal gathering in Turkey of the so-called "Friends of Syria."